"What are your EDUCATION RESULTS for KEY MEASURES or INDICATORS of accomplishment of your organizational strategy and ACTION PLANS?" 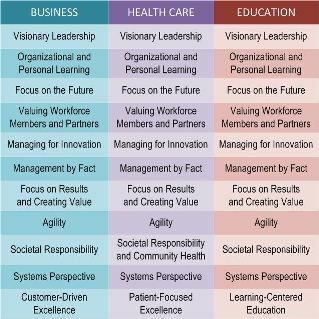 Baldrige apparently sees the new 7.4a question related to communication and engagement of the workforce with the vision and values as significantly more important than the previous strategy effectiveness results which they replaced because the total number of points increased 10 points from 70 to 80 while other Criteria questions remained the same. This raises an interesting logic-related question because strategy effectiveness often includes workforce engagement as a subset metric.